Cancer development in the colorectum, which is a major site for human malignant disease, is an excellent example of the multistage nature of cancer. 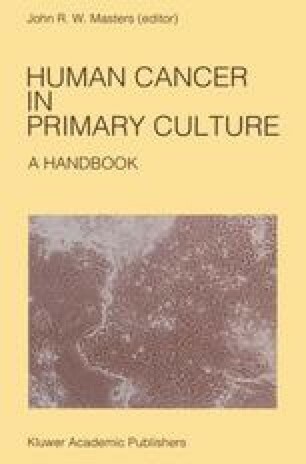 Most colorectal cancers develop from adenomas (premalignant tumours sometimes referred to as polyps) in what is called the adenoma carcinoma sequence (Muto et al., 1975). The adenomas are derived from the normal colonic epithelium lining the intestine. The normal epithelium serves as an interface between the organism and the colonic lumen. There are three differentiated cell types of the colonic epithelium: (1) Mucus-containing goblet cells, (2) Columnar (absorptive) cells, and (3) The enteroendocrine cells. All three cell types probably originate from the so-called stem cells which are thought to be present in the base of the crypts.